Newly elected Sooronbay Jeenbekov the 5th President of Kyrgyzstan. 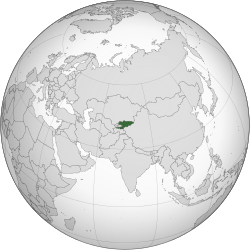 Kyrgyzstan remains the only Central Asian country, that retains a functioning democracy. In the 27 years since the end of the Soviet Union, democratic institutions have been under siege in the region. As the smallest of the former Soviet Republics, Kyrgyzstan at just 6.1 million, held a competitive election last October. It may well be the last one. Since independence, Kyrgyzstan has officially been a unitary parliamentary republic. It has continued to be one, despite ethnic conflicts, a number of revolts, transitional governments and ongoing political strife. The nation is also perceived, to be among the most corrupt in the world. The 2017 presidential election, marks the first peaceful democratic transfer of power in Kyrgyzstan. The election came after a referendum in 2016, to change the constitution and shift power from the president to the prime minister. 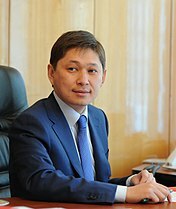 Theoretically this will mean, more political power will rest in the hands of Prime Minister Sapar Isakov. Unlike his predecessor Babanov, who was from an opposition party, the Prime Minister and the President are now, both from the Social Democratic Party. 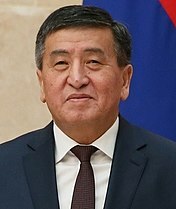 Former Prime Minister Sooronbay Jeenbekov, was backed by outgoing President Alma Atambayev and his Social Democratic Party. The latter had been in power since 2011. Jeyenbek received 54.3% of the near 1.7 million votes cast,which made a run-off totally unnecessary. 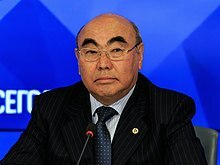 Businessman Omurbek Babanov, the former Prime Minister, who headed the opposition Respublika Party, came in second with 33.4%. Babanov was originally conciliatory at his loss, urging both stability and unity for the country. The election had involved 13 candidates and was indeed seen as an open contest, for a transfer in political power. Turnout was still low, at just 56% of 3 million eligible voters. Jeenbekov was sworn into office as the 5th President of Kyrgyzstan, last November and has already begun, to undermine the very foundations of democracy. The jailing of political opponents is already under way in Kyrgyzstan, as a mirror image of how the competition is dealt with, in other countries in Central Asia. Autocrats have held sway in neighboring Kazakhstan, Tajikistan, Turkmenistan and Uzbekistan since independence in the early 1990’s. 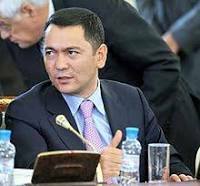 At the end of 2017, Omurbek Babanov the main political rival in the recent presidential election, felt compelled to vacate his parliamentary seat and leave politics altogether. He had already fled the country, after being threatened with a long term in prison. The trumped up charges being brought against Babanov, are namely inciting ethnic unrest. So he decided exile, was preferable to spending an extended period in custody. Kanatbek Isayev, a member of the legislature and supporter of Babanov, has received a sentence of nine years on charges of corruption. The case had been in limbo since 2011, but has since been actively pursued. He now faces the additional charge of plotting a coup, which will keep him imprisoned for many additional years. Also last year, Omurbek Tekebayev another opposition candidate ,was abruptly accused of taking a bribe in 2010. He was then sentenced for eight years in prison. Of course, this prevented him from mounting any kind of political challenge, to Jeyenbek in the October election. President Jeenbekov has touted that his nation is the first and only Central Asian country, with a functioning yet flawed, parliamentary democracy since independence in 1991. He is justified in saying this because twice before, protesters where able to summarily oust the government from power. The first Kyrgyz president, Askar Akayev, was overthrown in what has become known as the Tulip Revolution. This took place after the parliamentary elections, in March 2005. 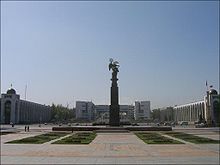 He was forced to resign the following month, as the capital city of Bishkek was being looted by protesters. A total of four members of Parliament, would be assassinated in the turmoil that followed. Although it was quite likely, that these legislators were involved in major corrupt business ventures. Opposition leaders subsequently formed a coalition and a new government was created under President Kurmanbek Bakiyev, who in turn was forced into exile in April of 2010. This came about as a result of corruption allegations, but his departure was induced, by rioters storming the presidential palace. He first fled to Kazakhstan and then later sought asylum in Belarus. The 2010 protests once again, involved government corruption and the rapid rise in the cost of living. As they became violent, President Bakiyev imposed a state of emergency. The police and security services, then moved to arrest opposition leaders. As the violence escalated, reports estimated that some 75 to 80 people had been killed and hundreds more injured. A new transition government was put in place, led by the former foreign minister Roza Otunbayeva, following the resignation of President Bakiyev. Once again, Prime Minister Daniar Usenov would level accusations, that Russia was meddling in the political affairs of Kyrgyzstan. Of course this assertion would be denied, by then Russian Prime Minister Valdimir Putin. In June of that year, came the South Kyrgyzstan ethnic clashes, between the predominant Kyrgyz and the Uzbeks. There were fears that the skirmishes, might well lead to open civil war. Although President Otunbayeva appealed for military aid from Russia, to help quell the disturbance, the only troops sent, were brought in to protect Russian facilities. These included military installations. Some 30,000 ethnic Uzbeks were reported to have fled their homes, to escape into neighboring Uzbekistan, as the violence mounted. Later, President Otunbayeva accused relatives of former President Bakiyev, of formulating the ethnic trouble, in an effort to destabilize the government. In August of that year, party leader Urmat Baryktabasov was arrested on charges of plotting to overthrow the government. 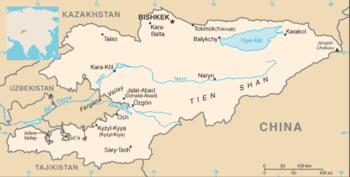 A report on the South Kyrgyzstan ethnic clashes, was released the following year. It summarized that the entire situation, was caused by a large scale effort, towards splitting the country along ethnic lines and ending the political unity of the country. 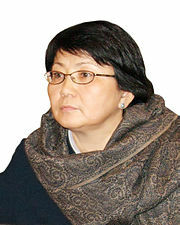 Interim President Otunbayeva then announced, that she would not be running in the 2011 elections. The presidential election held in November, was won by the then Prime Minister Almazbek Atambayev, the leader of the ruling Social Democratic Party. Omurbek Babanov was later appointed Prime Minister. Russia maintains substantial influence in Kyrgyzstan. This is through economic, political and military means. The country remains a member of the Russian dominated, Commonwealth of Independent States. The latter, is the diplomatic successor to the now defunct Soviet Union. It must be noted that some 40% of Kyrgyzstan’s Gross Domestic Product (GDP), comes from remittances sent from the near 800,000 Kyrgyz migrants, who have employment inside Russia. Western influence in Kyrgyzstan is largely through financial and economic aid. As the second poorest nation in Central Asia after Tajikistan, well over a third of the country, lives below the poverty line. The Asian Development Bank, the International Monetary Fund (IMF) and the World Bank, have all been attempting to assist, with the development of Kyrgyzstan. Early market reforms had allowed the country to join the World Trade Organization (WTO) in 1998. The original government decision made by former President Bakiyev, to close the American operated Manas Air Base in February of 2009, had been later reversed in June of that year. After heavy lobbying and an increase in annual rent from $17.4 million USD (United States Dollar) to $60 million USD, it was agreed that the United States, would be able to maintain its last military installation in Central Asia. Although Kyrgyzstan is a country rich in mineral resources, it needs to imports both natural gas and oil for its energy needs. Although its exports have become more diversified in their destinations, the country remains still quite dependent, on imports from China and Russia. The overly large trade relationship, the country has with the aforementioned, will have an impact on the increasingly repressive political situation. The Communist Party dominance in China and the increasingly autocratic Russia, will not provide any support for the democratic institutions now under attack inside Kyrgyzstan.